At Wendy’s, we believe leadership happens from the front of the pack, not the back. That’s why we never settle for the status quo, or the bare minimum – but instead work to raise the bar and to redefine the standards that consumers expect from the quick service restaurant industry. 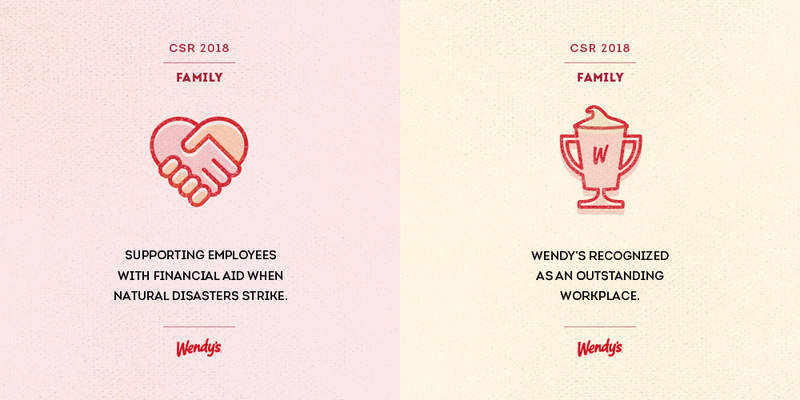 This week, we shared our annual update on Wendy’s corporate social responsibility (CSR) and sustainability initiatives. We’ve been busy this year – from raising more than $18.7 million to support the Dave Thomas Foundation for Adoption in partnership with our franchisees to providing more than $100,000 in financial aid to Wendy’s family members impacted by natural disasters; to improving the energy efficiency of our restaurants, we’ve made significant progress, and we know there’s still much more we can do. Importantly, we also announced an industry-leading step that will allow Wendy’s to better understand, verify, and identify improvement areas and communicate how cattle for Wendy’s beef* are raised. By becoming the first restaurant chain to partner with the Progressive Beef™ program, an innovative animal care and sustainability program that is built on proven-best practices and third-party verification, we will be able to make good on our commitment to get closer to the farm and ensure antibiotics are used responsibly along the way. Adoption of this program – which verifies cattle for beef were raised in accordance with specific animal welfare standards – will be implemented in a substantial part of Wendy’s beef supply starting in 2019, with at least 50 percent by 2021. Learn more about the Progressive Beef program. Our brand was built on the unique offering of fresh, never frozen beef – and that continues to distinguish us. But, in the spirit of leadership, we have to constantly raise our game so that “fresh” remains synonymous with “the very best we can bring to customers.” That means continuing to bring greater transparency into our beef sourcing, being as purposeful as possible and pursuing partnerships that help us on our journey. We don’t approach ingredient sourcing as buying what’s available. We view it as defining what we believe should be available for our customers, and then working with suppliers to bring it to life. Our transition to high-quality, greenhouse-grown tomatoes is another example of how we work to set the bar for sourcing fresh food. Defining and setting new standards is what sets Wendy’s apart. And when those standards are rooted in good business practices that benefit our food, our family and our community – well, that’s what we call a win-win-win! We can’t wait to take 2019 head-on – and we hope you’re as excited as we are for what’s to come! Happy New Year to you and yours! * Fresh beef available in the contiguous United States, Canada and Alaska.